Our students thrive in an atmosphere that promotes exploration and collaboration across all areas of research and study. Our professors have an infectious passion for instruction and strive to teach each course better than it’s ever been taught before. Undergraduates and teaching assistants enhance the quality of the department with their research, knowledge, and creativity. Rigorous standards and a supportive culture combine to foster a powerful environment for learning. Our undergraduate curriculum is designed to give you a sophisticated understanding of the fundamental principles and prevailing and emerging approaches to biology with particular emphasis on molecular and cellular biology. Coursework emphasizes methods and logic rather than a particular set of facts. Undergraduate study in the department provides a strong foundation for research and a variety of career opportunities. Laboratory research allows you to gain a working knowledge of experimental design, data evaluation, and scientific presentation. 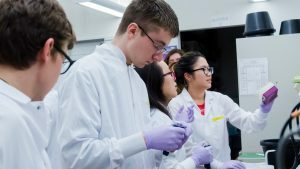 Our affiliated labs and research centers afford unprecedented opportunities for undergraduates to participate in groundbreaking projects and interdisciplinary collaborations with clinical and therapeutic applications. When undergrads swap stories with their counterparts at other schools, they quickly come to the conclusion that the MIT Biology experience is different. We encourage our students to think creatively as they define their own course roadmap.